It is a paradox that some of the easiest, most fun fish to catch are also among the hardest to cook well. Small, bass-like fish — those with largish heads, prickly spines and large rib cages — really need to be at least a good foot long to be worth filleting, and even that’s a small fillet. What to do? The answer is to cook them whole. You get exponentially more meat off each fish, you waste less and, well, it’s just damn fun to tear into a whole fish at the table. There’s something primal about it I really like. Virtually every culture cooks whole fish in some way, shape or form. 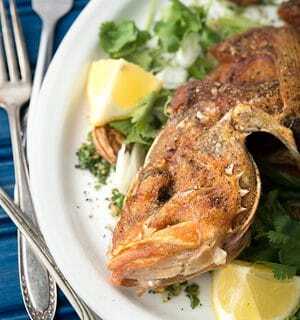 The people of the Mediterranean, from Turkey to Spain, grill whole fish as good as anyone. 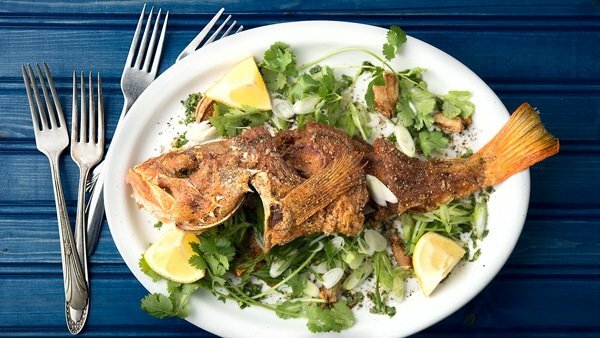 You can bake a whole fish in salt. The Chinese steam them, then pour sizzling chile oil over them right before you eat them (gotta try that). In Sichuan, one of their signature dishes is sweet and sour crispy fish, which I make a lot. I thought I’d make it again when I got home from Southern California recently, four pretty Pacific rock cod in my cooler. I had a great time catching them on the New Del Mar, easily landing my 10-fish limit. I gave away most of my fish to some newbie anglers who were not so lucky. But as I drove the long trip home — Santa Monica is a solid 6 1/2 hours from my house in NorCal — I thought I should do something different. Spring is here and I wanted a lighter, fresher kind of fish. My thoughts immediately went to Southeast Asia, where they are geniuses with fresh herbs, citrus and chiles. Then I remembered a recipe in one of my favorite cookbooks, Cooking from the Heart: The Hmong Kitchen in America. Hmong are a group of Southeast Asians who fought with us against the Communists in Vietnam, and after the war thousands came here to live. There are large Hmong communities in Minnesota’s Twin Cities, in San Jose, Fresno and here in Sacramento, California. I happen to like the Hmong. They’re good outdoorsmen and generally nice people in my experience. Long-time readers of HAGC might remember that I’ve cooked a few Hmong dishes before, like their awesome, herby country-style sausage and a fantastic squirrel stew. Hmong food is generally a country cousin of Vietnamese food, which can be quite refined. Lots of fish and game, lots of fresh herbs, chiles, citrus and fish sauce. What’s not to love? This recipe is killer. Absolutely killer. 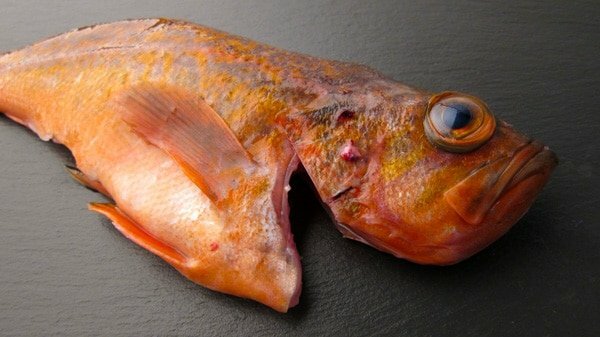 The trick is to crispy fry plate-sized fish until the bones and spines soften, then tear into it. You end up eating about a third of the bones, which are reduced to crunchy, nutty tidbits. Crispy, meaty, crunchy, with the zing of citrus, the freshness of the herbs and the occasional warm note from the fried garlic make this a near perfect plate of food. Could you do it with fillets? Yeah, I suppose. But that would be less fun. 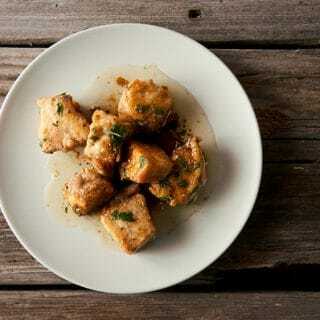 This recipe work with any bass-like fish. I mostly use Pacific rock cod (rockfish), but perch, large- or smallmouth bass, walleyes, black seabass, croakers, puppy drum, porgies, large crappies or bluegills would all work. The ideal length for the fish is about the size of a big dinner plate. You can use larger fish, but you'll probably want to split one fish for two people, and that's not quite as fun as getting to tear into a fish of your own. Everything here should be pretty easy to find, with the possible exceptions of the lemongrass and the fish sauce. Both are readily available in larger supermarkets now, and any Asian market will have them. If you can't find it, use soy sauce. Take the fish out of the fridge and rinse it under cold water, checking for any remaining scales. Remove the gills if they are still there. You can snip off the fins with kitchen shears if you want. Use a sharp kitchen knife to slash the sides of the fish perpendicular to the backbone. Make the slices at an angle, from the tail end toward the head end. This opens up the fish to the hot oil and makes it cook faster. Salt the fish well and set aside. Make the dipping sauce by combining all the ingredients in a bowl. Make sure everything is chopped fine. Set aside. A wok is the best thing to use for cooking these fish, unless you have a deep fryer. I have both, and still prefer the wok. A large frying pan will work, too. Heat the oil until it is between 330°F and 350°F. Fry the crushed garlic cloves until they are a lovely brown and remove. Gently put one or two fish into the hot oil. It's OK if the tails and heads are not submerged. It will sizzle violently, so watch yourself. Use a large spoon to baste the fish with the hot oil as it cooks. Fry like this a solid 6 to 10 minutes, depending on how thick the fish is. You want it very crispy and golden brown. Carefully flip the fish -- I use two spatulas to do this. Fry another 5 to 8 minutes. Repeat with any remaining fish. If you do have to do this in batches, let the cooked fish rest on a rack set over a baking sheet in a 200°F oven. To serve, lay the fish down on plates and grind a healthy portion of black pepper over them. Black pepper is a signature flavor in this dish so be generous. Arrange the fried garlic and the remaining garnishes alongside. Serve with the dipping sauce and white rice. Serve the fish with the garnishes around it, and the dipping sauce in the middle of the table. Forks or chopsticks are a must, as is a big bowl of steamed white rice. A really good bite is some fish on top of a little rice, with a bit of the dipping sauce spooned over it. You’ll find dozens and dozens of recipes for both freshwater and saltwater fish right here on Hunter Angler Gardener Cook! Made this with bluegills from my pond and was delicious. How come no one ever told me about this? Excellent, My next striped bass is going to be cooked this way! I’m in Australia, and we don’t have any of these fish by these names. How do you think rainbow trout would work? Peter: Not so good. You want a firm white fish. Barramundi would be nice. What a wonderful recipe! We had some trout from a fishing trip this last summer and it was fantastic for those. The sauce is a total keeper! Thank you for sharing it!